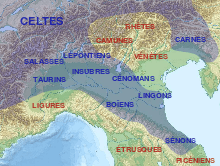 Cisalpine Gaul (Gallia Cisalpina), also called Gallia Citerior or Gallia Togata, was the part of Italy inhabited by Celts (Gauls) during the 4th and 3rd centuries BC. Conquered by the Roman Republic in the 220s BC, it was a Roman province from c. 81 BC until 42 BC, when it was merged into Roman Italy. Until that time, it was considered part of Gaul, precisely that part of Gaul on the "hither side of the Alps" (from the perspective of the Romans), as opposed to Transalpine Gaul ("on the far side of the Alps"). In the Second Punic War, the Boii and Insubres allied themselves with the Carthaginians, laying siege to Mutina (Modena). 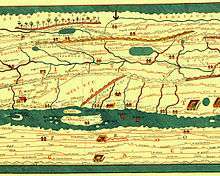 In response, Rome sent an expedition led by L. Manlius Vulso. Vulso's army was ambushed twice, and the Senate sent Scipio with an additional force to provide support. These were the Roman forces encountered by Hannibal after his crossing of the Alps. The Romans were defeated in the Battle of the Ticinus, leading to all the Gauls except for the Cenomani to join the insurgency. Rome then sent the army of Tiberius Sempronius Longus who engaged Hannibal in the Battle of the Trebia, also resulting in a Roman defeat, forcing Rome to temporarily abandon Gallia Cisalpina altogether, returning only after the defeat of Carthage in 202 BC. 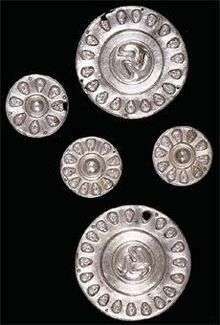 Rome conquered the last remaining independent Celtic kingdom in Italy in 192 BC. 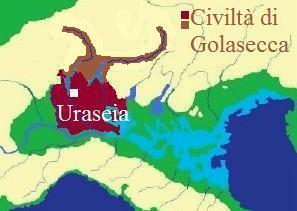 ↑ Maps of the Golasecca culture. ↑ Kruta, Venceslas (1991). The Celts. Thames and Hudson. pp. 52–56. ↑ Stifter, David (2008). Old Celtic Languages (PDF). pp. 24–37. ↑ Boardman, John (1988). 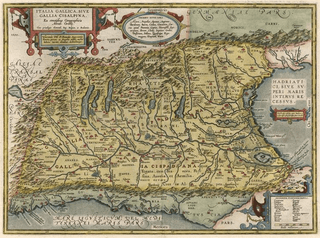 The Cambridge ancient history: Persia, Greece and the Western Mediterranean c. 525-479 BC. p. 716. ↑ "Archived copy". Archived from the original on 2013-05-18. Retrieved 2015-03-04. ↑ Kruta, Venceslas (1991). The Celts. Thames and Hudson. p. 54. ↑ Kruta, Venceslas (1991). The Celts. Thames and Hudson. p. 55. ↑ "Museo del monastero di Santa Giulia in Brescia". Santagiulia.info. Retrieved 2011-09-16.